This step-by-step guide prepares teachers to support the literacy development of linguistically diverse learners at school. The Literacy Club provides effective instruction and intervention for language learners in English and/or Spanish. K-5 teachers learn to use a wide range of tools, resources, and strategies that accelerate literacy development, and to continuously monitor their students' progress in oracy, literacy, and metacognition. 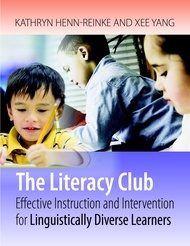 The Literacy Club is a Tier 2 or intermediate intervention for small groups of language learners who struggle with literacy, and it has been field-tested in English as an additional language (EAL) and dual language/bilingual contexts. The Literacy Club draws on elements from Reading Recovery (Clay, 2013), Guided Reading (Fountas & Pinnell, 2010), Literacy Squared (Escamilla et al, 2014), and the SIOP model (Echevarria, Vogt, & Short, 2012), and it addresses state content and English language development standards. Henn-Reinke and Yang show teachers how to adapt and implement the Literacy Club for K-5 students in their schools. The advancing bilingual strand is for students in bilingual programs who have a strong foundation in Spanish oracy. The emerging bilingual strand is for students in dual language programs who are just developing Spanish oracy. The English as an additional language strand is for students in English-medium classrooms who are learning English as an additional language for academic purposes at school. Schools/districts may choose to implement any or all of these strands, depending on their student needs and instructional resources. Caslon now offers a book study guide with a purchase of 10 or more copies of this title (with meetings based on each book chapter). Click here to see a sample meeting from this guide. The guide supports teachers’, coaches’, and administrators’ professional learning so that they can promote equity and excellence for the bilingual and English learners in their districts, schools, and classes. Professors can also use these guides to help students clearly articulate goals and objectives and design culminating projects that provide evidence of their learning.